Critical, independent voices are seldom found within the citadels of international finance. That's what makes Nomi Prins unique. During fifteen years as an executive at skyscraping banks like Goldman Sachs, Bear Stearns, and Lehman Brothers, Prins never lost her ability to see the broader picture. She walked away from the game in 2002 out of disgust with the burgeoning corporate corruption, just as its magnitude was becoming clear to the public. In this acclaimed expose, named one of the best books of 2004 by The Economist, Barron's, Library Journal, and The Progressive, Prins provides fascinating firsthand details of day-to-day life in the financial leviathans, with all its rich absurdities. She demonstrates how the much-publicized fraud of recent years resulted from deregulation that trashed the rules of responsible corporate behavior, and not simply the unbridled greed of a select few. While the stock market roared on the back of phony balance sheets, executives made out like bandits and Congress looked the other way. Worse yet, as the new foreword to this edition makes clear, everything remains in place for a repeat performance. 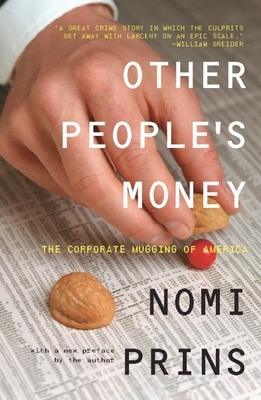 Nomi Prins has worked at Goldman Sachs, Bear Stearns, Lehman Brothers, and Chase. She has written for the New York Times, Newsday, Fortune, and The Guardian and appeared on numerous international media programs. She is a senior fellow with the public policy center Demos and lives in New York City.